Minot State University, its Program of Theatre Arts and Campus Players will host the Region 8 One-Act Play Contest Thursday (Nov. 10) in Aleshire Theater, 8 a.m.-5 p.m. Aili Smith, MSU theatre associate professor, Angela Schnaible, MSU speech and theatre adjunct instructor, and Angelia Johnson, retired Ray English and theatre teacher and Minot State alumna, will judge the event. The tentative schedule is Bishop Ryan with “You’re Driving Me Crazy” at 8 a.m., Lewis and Clark with “Hamlette” at 8:50 a.m., Surrey with “Blaster” at 9:40 a.m., Mohall Lansford Sherwood with “Mirrors” at 10:30 a.m., and Westhope with “The Spell of Malatesta” at 11:20 a.m. At 1 p.m., Glenburn will perform “4 A.M.,” Velva will present “Two Fronts” at 1:50 p.m., Bottineau will perform “Note to Self” at 2:40 p.m., Drake-Anamoose will present “Lockdown” at 3:30 p.m., Towner Granville Upham will present “The Brothers Grimm Spectalathon” at 4:20 p.m., and Surrey High School will perform "Stoplight" at 4:45 p.m. Judges will give awards for outstanding performance, outstanding technical theatre work, and honorable mention acknowledgements. Two plays will advance to the state contest in Jamestown on Nov. 21-22. For questions, contact Neuharth at Kevin.Neuharth@minotstateu.edu. A Veteran Friendly Employer Summit is planned for Thursday (Nov. 10) in the Conference Center, 10 a.m.-3 p.m. Rep. Kevin Cramer will participate in a town hall discussion, a discussion panel will deliberate “Employment barriers, opportunities and expectation,” and the afternoon will feature three breakout sessions. For more information, see the Summit flier or contact Andy Heitkamp, Veteran Center director, at Andy.Heitkamp@minotstateu.edu or 858-4002. The ASTEP (Advancing Students Toward Education and Employment) Project at the North Dakota Center for Persons with Disabilities is sponsoring a campus-wide safety training Thursday (Nov. 10) in Hartnett 327 from noon to 1 p.m. Aaron Moss, Minot Police Department’s Crime Prevention Division senior patrol officer, will present tips for staying safe in the community. This training is open to all Minot State University students, staff, and faculty. For questions, contact JoLynn Webster, NDCPD research associate, at jolynn.webster@minotstateu.edu. Tuesday (Nov. 15), 2-3 p.m. in Old Main 314 — “Outlook with a Touch of ShoreTel” by Linda Conn, ITC office clerk. Nov. 29, 1-3 p.m. in Old Main 314 — "Intermediate Excel" by Jan Repnow, business information technology assistant professor. 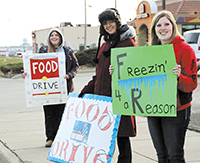 The Minot State University Student Social Work Organization is sponsoring Freezin’ for a Reason Nov. 19 in the Marketplace Foods’ parking lot (1930 South Broadway, Minot), 9 a.m.-5 p.m.
SSWO members stand in the cold and “freeze” to experience homelessness firsthand. Individuals can participate by dropping off food or monetary contributions at the parking lot or by “freezing” with the SSWO members. Other MSU student organizations, such as the Beta Theta Sorority, are joining SSWO members. Kendra Bartel, Minot, is the other co-chair. For questions about the Minot event, contact Dionne Spooner, MSU SSWO faculty advisor, at 858-3142 or dionne.l.spooner@minotstateu.edu or SSWO members at sswo@minotstateu.edu. On Nov. 19, prospective students and their families can “test drive” Minot State University at Preview Day. The check-in segment starts at 10 a.m. at the east door of the Student Center. Preview Day itself runs from 10:30 a.m. to 2:30 p.m. Preview Day will also include a department fair showcasing MSU’s many academic options; breakout sessions giving students hands-on, exciting learning opportunities; and an optional campus tour. Students will be immersed into what MSU strives to do: keep students first and engage them in the classroom. Students may register online for the event. For questions, contact Forrest Macy, admissions counselor, at 858-3176, or forrest.macy@minotstateu.edu. The Northern Lights International Film Series continues Nov. 21 with the 2002 Russian film, "The Cuckoo." In Aleksandr Rogozhkin's film, as Finland's withdrawal from World War II draws closer, a tentative relationship between an abandoned Finnish soldier, a Sami woman and a Russian captain accused of anti-Soviet correspondence offers momentary solace to a trio of lost souls. The film begins at 6:30 p.m. with a social preceeding the film at 6 p.m. The event is free and open to the public. There will be a door prize drawing for a gift card to a local restaurant supporter of the film series. For questions, contact Scott Sigel, assistant professor of foreign language, at scott.sigel@minotstateu.edu. Dr. Tami Jollie-Trottier, clinical psychologist with Belcourt’s Seven Stones Health Clinic, will discuss generation art and turtle medicine Nov. 22 in Aleshire Theater at 7 p.m. Her Native American Cultural Celebration presentation is in conjunction with the Northwest Art Center lecture series. The enrolled member of the Turtle Mountain Band of Chippewa received her bachelor’s degree in psychology from Minot State University in 1999. In 2005, she earned her doctorate in clinical psychology from the University of North Dakota. She then completed a two-year fellowship in health psychology research at UND School of Medicine; and one year of specialty training at the Eating Disorder and Neuropsychiatric Research Institutes in Fargo. She has provided clinical services for Indian Health Services, Behavioral Health, since 2008. In 2015, she received the MSU Alumni Association’s Young Alumni Achievement Award. The lecture is free and open to the public. For questions, contact Annette Mennem, Native American Center director, at 858-3365 or annette.mennem@minotstateu.edu. Amanda Watts, English and humanities instructor, will discuss “Glue Lives” Nov. 23 for The Two-Minute Lecture Series. She will be in the Beaver Creek Café by the curved wall at 12:30 p.m. Come on out and time it. For questions, contact Robert Kibler, professor of literature and humanities, at Robert.Kibler@minotstateu.edu. The Beta Theta Sorority donated half the proceeds from its silent auction and chili cook-off to the Souris Valley United Way. The chili cook-off competition was between members of the Beta Theta Sorority and Minot State University’s League of Social Science. Miranda Lessmeister, a Beta Theta Sorority member, won with a chicken white chili. After the cook-off, sorority members donated the leftover chili to the Minot Police Department to thank the officers for all they do for the community. Minot State University welcomes new employees, Katy Allers and Richard “Rich” McBride. Allers, Division of Humanities administrative assistant, was previously employed by the Minot Downtown Business and Professional Association. She enjoys acting in Mouse River Players productions and attending hockey or football games. She and her husband, Jim, have two children. McBride, an assistant men's basketball coach, last coached at the University of Illinois at Springfield, where he spent three seasons as an assistant coach. He earned All-Big Ten honorable mention as a senior and was a part of the 2005 NCAA Final Four team at the University of Illinois at Urbana-Champaign. He was team captain and named the Most Valuable Player in 2007. He earned a bachelor’s degree in sports management at UIUC. Nov. 9-10 — “Nuances,” collaged monotypes by North Dakota native Michelle Lindblom, Hartnett Gallery. Nov. 17-Dec. 22 — “Missouri Valley Gold,” Plein Air paintings by Greg Walter, Dickinson State University associate professor of art, Library Gallery.